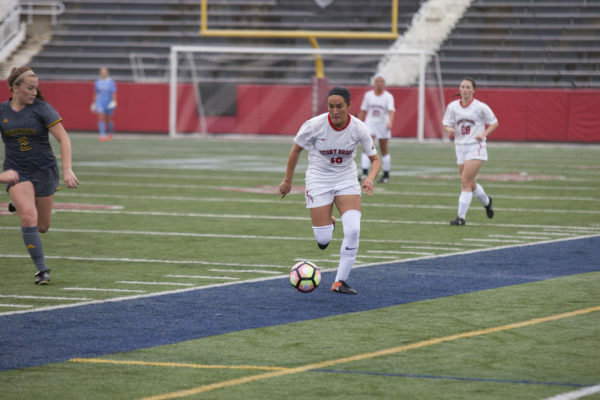 Less than one month ago, Stony Brook Women’s Soccer senior forward Manuela Corcho figured she had played her last match at Kenneth P. LaValle Stadium in the team’s 1-0 loss to Albany on Oct. 19. The Seawolves finished their regular season with two straight losses and headed into the America East Conference championships as a No. 5 seed, the second-lowest in the tournament. But a few weeks later, after defeating No. 4 Hartford and No. 1 New Hampshire, the Seawolves found themselves playing No. 6-ranked Vermont at home in the conference finals, with Corcho right in the middle of the action. With Stony Brook up 1-0 in the 33rd minute, Corcho fielded a pass from freshman forward Rachel Florenz, crossed up her defender and ripped a shot into the back of the net for the decisive goal in the 2-1 victory. The goal, which sealed Stony Brook’s second-ever America East title, is arguably the highlight of Corcho’s college career. Corcho had trouble recalling the feeling of winning the championship at home into words. Sunday’s match was intensely physical, with both teams registering 19 combined fouls against just 16 combined shots. The wet pitch facilitated aggressive play from both teams, with possession routinely being won or lost in the middle of the field. Despite finishing the regular season with an 8-10 overall record, Faherty said he felt the team’s tournament run was far from surprising. The Seawolves came out firing from the moment the match started, with freshman forward Alyssa Francese taking the team’s first shot on goal just 38 seconds after the opening whistle. Francese broke through later on in the first half for the first goal of the match. The forward fielded the ball off a low cross from junior defender Kaitlin Loughren in the 18th minute, and curled a shot into the top-left corner of the goal to put the Seawolves up 1-0. Stony Brook was in control of the lead for most of the match, but after surrendering a goal to Vermont senior midfielder Sarah Martin in the 62nd minute, a renewed Catamounts attack looked poised for an equalizer. Vermont put two shots on goal in the final two minutes, both of which were stopped by last-ditch efforts from Stony Brook freshman goalkeeper Sofia Manner. Stony Brook’s first conference title since 2012 moves its overall record to 11-10 in preparation for the NCAA Women’s Soccer Tournament. Brackets will be announced during the NCAA’s selection show on Monday, Nov. 6 at 4:30 p.m.